It doesn’t take long to discover that sportsmanship and character have come under a microscope with antics that range from youth sports to the NFL . This doesn’t count the plethora of sports teams at all levels that engage in organized contests throughout the country. The main question is what direction should be taken to find a solution that can easily be understood ,and then monitor constantly so the problems can’t escalate. Children watch their parents and other adults to form a basis for charatcter traits . Being a positive role model will be an effective way to help their children toward character building and fair play .They form an understanding of competition and sportsmanship when they are in a school setting. Physical educators can work on sportsmanship and character by demonstrating proper behavior during classes and activities.This conduct should be taught to all members of the school district including parents , teachers , coaches , cheerleaders and the band. Parents hold the initial key for appropriate sportsmanship and character building. They should emphasize good sportsmanship and expect that winning is just one of many goals their children can achieve. . By taking pride in their accomplishments and improving skills , the athlete can see themselves as winners not only by the final score. Unfortunately, brash behavior that is seen on the national level in professional and collegiate sports seem to have a negative influence . The next step in the sequence is coaching. 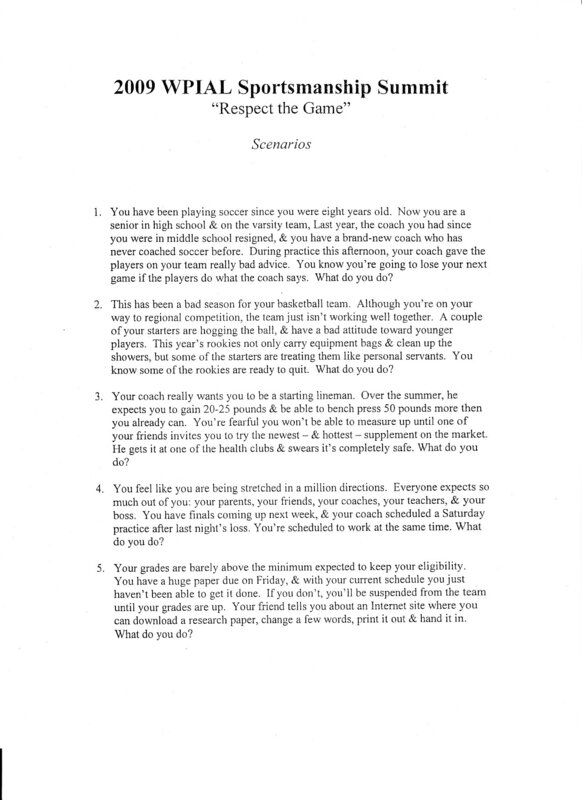 A code of conduct should be sent home and signed by both the parents and players to cover what the coach expects ,such as losing temper , cheating , blaming , taunting , arguing with officials , and criticism of teammates.Coaches should attend a district sportsmanship seminar/conference before each season to learn new rules and what is expected from each district or league office . There needs to be an open communication with the parents , community , school board and administration about rules , judgment on problem behavior and have a plan in place to enforce decisions when the rules are broken . There is a phenomenon that has taken sportsmanship to a new and different level , which has been propagated through the collegiate ranks , especially those that involve basketball games. It appears the high school crowd has mimicked the frolics that transpire during the games . Student sections are becoming creative , funny and amusing , but sometimes create problems with chants that can be offensive or rude .In past seasons students have chanted during basketball games , but there has been a drastic change as they are louder and have become more creative with chants and garbs than ever before. They have become controversial, with insensitive and sometimes vulgar chants that can be offensive. By using various social networking sites , they can find out some disparaging details about opposing players and their schools. Hopefully , at this point ,the athletic director or a teacher in charge will quell any possible concerns and problems. March 1st ,2011 is National Sportsmanship Day , which is an exemplary model for information in ethics , promotional suggestions for fair play , and a packet that includes articles about sportsmanship , gamesmanship , coaches and parents forum and contests to promote conduct while participating in a sport. One of the most difficult tasks faced by athletic directors and administrators is to maintain a healthy school spirit while promoting good sportsmanship. The answer may lie in involving the student body. Administrators can arrange a round table for the students to brainstorm scenarios of sportsmanship to share their thoughts to discuss issues to help their students have fun at these events and still maintain a commitment for school sportsmanship for every team or activity that the school sponsors. Building character and commendable sportsmanship are responsibilities that physical educators should embrace . The use of Hellison’s Model of Responsibility and John Wooden’s Pyramid of Success are viable ways to help encourage students to prepare for the character building process . This can be accomplished with the physical education classes and carried over through appropriate practices during games and activities. There will be obstacles to overcome as the constant barrage of media outlets , TV ads and articles written in sports magazines and the unflappable “look at me” exploits by many of the professional and college athletes may deter that process . The answer will be to take that first step , which includes students , parents , coaches , administration , and athletic directors to all work together for citizenship through sports alliance. There are specialty programs that involve mascots to teach the values of fair play and sportsmanship .There are important details with lesson plans , goal setting , teamwork , making a community , encouragement and awards that can be attained through sportsmanship . 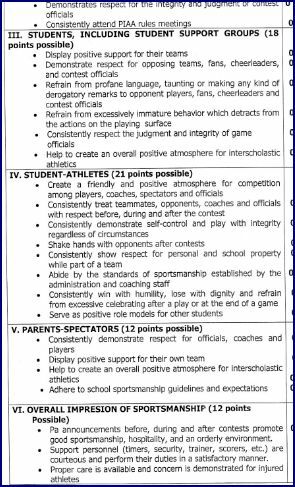 Addendum and Editors note: Within my area near Pittsburgh(PA) is a school that has won the sportsmanship award for two years . Hampton High School in Allison Park last won the award August , 2010 . Mr. Bill Cardone , athletic director , and three other school directors were presented the award at Heinz Field before the W.P.I.A.L. 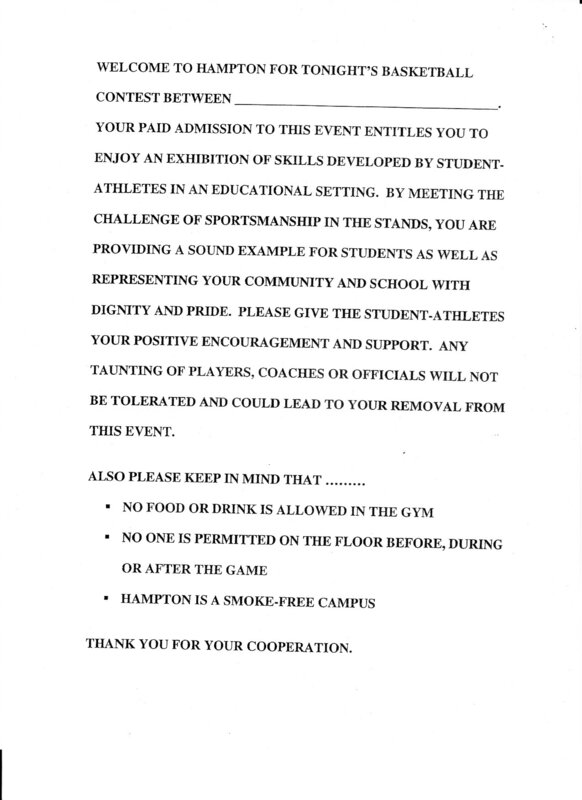 football championships.Hampton realizes that sportsmanship is a key issue from the elementary to high school levels , and this is maintained through meetings with all the principals. The purpose of the sportsmanship program is to educate , promote and assist in the perception of and the practice of those qualities which are inherent in good sportsmanship . The ideals of sportsmanship apply equally to all disciplines. 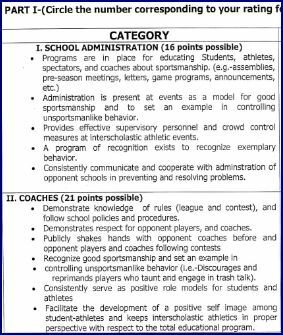 Individuals ,regardless of their roles in interscholastic athletics , are expected to be aware of their influence on the behavior of others and act in a responsible manner at all times. Included in this issue will be the WPIAL Sportsmanship Program /Member School Self Assessment Form , a six category rating system with an additional three parts that provides evidence as to why a school is deserving of the award.There is a pre-game speech before each basketball game and a National Sportsmanship Breakfast , which Hampton asked their coaches to nominate students who exhibit leadership that was sponsored by the Institute for International Sport . Also, a WPIAL Sportsmanship Summit , which includes discussion questions and scenarios of examples regarding players , coaches , and grades. Note : W.P.I.A.L. ( Western Pennsylvania Interscholastic Athletic League) and the P.I.A.A ( Pennsylvania Interscholastic Athletic Association ) are the two Board of Control groups that have been involved in making sportsmanship important for all member schools. The PIAA promoted the slogan “ The missing piece is you.” Just recently(1/21/2011) , both groups must decide the fate of a girls basketball coach , who ran up the score in a 100 point win . An announcement about sportsmanship is read before every game across the state and it remains to be seen what decisions will be made . It will take more than a pre game speech to find a solution , but by working together in all aspects of home and school , the problems of sportsmanship can move forward with an encouraging outlook .This can be accomplished with promotional activities , handling conflicts appropriately , crowd control and always have a contingency plan in place.